I’m making a long overdue return to Las Vegas this summer and as if being back in the bosom of my favourite place wasn’t exciting enough, there’s a new Marc Jacobs store on the strip, ready to accept my drunken dollars. The store opened in April and to celebrate its launch, marketing maestro Marc released a series of Vegas-themed t-shirts. They’re available at Marc by Marc Jacobs stores across the globe, but really you want to be buying one when you have a plastic guitar filled with margarita around your neck, a Divas Las Vegas t-shirt on and a dead look behind your novelty sunglasses… don’t you? Not sure I can get behind a stripper shirt, but the dollars and gambling designs are A-OK, right? 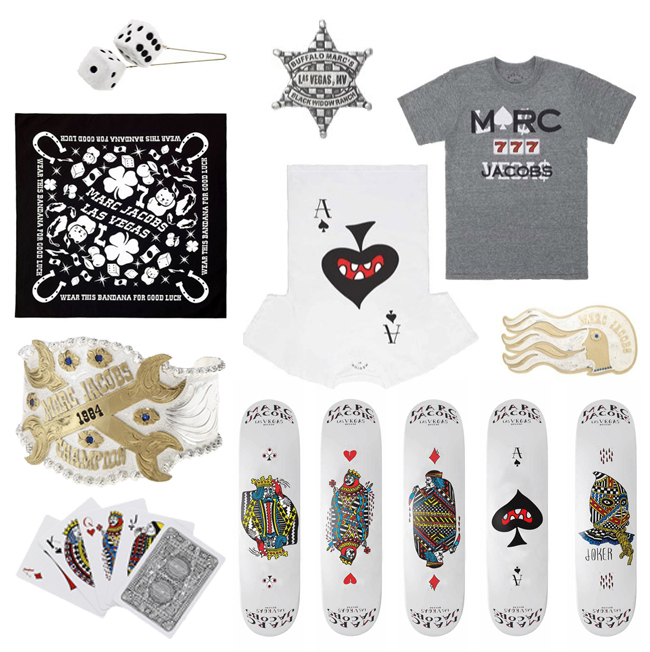 There’s also scarves, belts, skateboards, playing cards, badges, fluffy dice… and all that other good stuff we’ve come to expect from Marc. It makes sense really, in Vegas they put the word ‘Vegas’ on everything you can imagine and Marc likes to put his name on everything you can imagine – a match made in heaven.